Who Is Nate Dodson And What Is Microgreensfarmer.com? My name is Nate Dodson and I founded Hugs Urban Farm in 2015. I started my farm and began growing and selling microgreens (and other crops) as a way to supplement my income and hopefully transition out of a full-time job that I was starting to really dislike. I loved my co-workers, but could no longer stand the long hours away from my wife and daughter, and having to wake up at 5am every morning to a blaring alarm clock. Started my first official after-college “career” working as a restoration ecologist. Spending long hours working outdoors and getting covered in sweat, ticks, chiggers, poison ivy, and toxic herbicide all day started to get old really fast. Started to feel sad and scared thinking about my next 40+ years of working in the real world. Had my first child, increasing debt and a mortgage, and felt trapped and incredibly worn out from my day job. Many weekdays were spent working out-of-town staying in hotel rooms, and I desperately missing my wife and newborn daughter Josie. Started having many health problems including flare ups of my crohn's disease and very dark depressing thoughts. This was probably the hardest year of my life. Fearing I wouldn’t be on this earth much longer if my health continued to suffer and if I kept going at my job that I hated, I began desperately looking for a way out - a new direction for my life. This is when I stumbled onto the idea of starting an urban farm. I was already an enthusiastic gardener and in a situation where it honestly felt like I was hitting rock bottom anyway, so I decided I had nothing to lose and gave it a go. Hugs Urban Farm was born. Starting a business is exhilarating and challenging! I continued at my day job for part of the year and worked on Hugs Farm early mornings, nights, and weekends. It was exhilarating to land my first restaurant customers, start selling at the farmers markets, and launch our “mightygreens” home delivery program. It was also EXTREMELY challenging to keep up with everything. I was spending a lot of money to ramp up the farm - more than I was making in sales. I often layed in bed at night feeling like I was having a panic attack from all the stress. I knew something had to change, so I decided to make some drastic and risky moves by once again by quitting my job and doubling down on what was working best on the farm - microgreens! Things take a drastic turn for the better! Things started to really get good for me when microgreens became the focal point of my farm and life. I was really enjoying the wonderful responses and interactions I was having with customers. I also launched my bike-based farmers market stand which I dubbed the “salad cycle”. 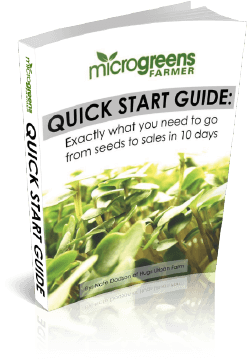 This was also around the time that I began sharing some of the tips, tricks, and successes I was having through the Microgreens Farmer website and YouTube channel. My subscribers began begging me to release more content or an online course outlining my process and so I recorded and released “Microgreens Business” in the fall of 2016. Enrollment in my microgreens course is skyrocketing! At this point, over 1000 people have enrolled in Microgreens Business, and it has steadily remained the best course in the world for helping people launch a successful microgreens enterprise. Hundreds of thousands more continue to learn and follow along through social media and the free email newsletter. I feel so grateful everyday knowing I’m helping so many people pursue their dreams, find work that’s meaningful, quit jobs they hate, launch their microgreens business, and enjoy a fun and profitable new way to make a living! I’m dedicated to continue offering the worlds #1 online course teaching YOU how to launch and grow a successful microgreens business. And the overall mission is to get more people growing food locally, more people eating incredibly healthy greens, and more wage slaves quitting their jobs to pursue this incredibly fun and meaningful work! Are you ready to do this? I’m here to help!